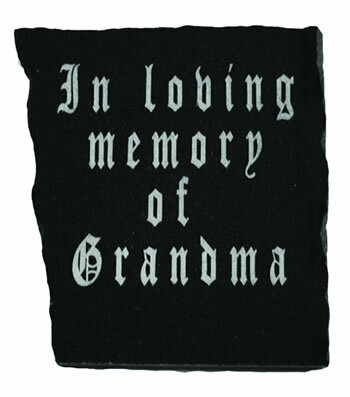 Memorial Stone, Etched Granite, Free Form..
Home > Memorials > Memorial Stones > Memorial Stone, Etched Granite, Free Form.. Granite is one of the hardest and most durable rocks on the planet which makes it the perfect choice for creating a lasting personal memorial. These stones are free-form in shape and can hold up to six lines of text, depending upon the size of stone selected. We use a state-of-the-art etching system which results in a slight texture to the text and a color variation which makes the words easy to read. This absolute black granite has a free-form shape that varies in thickness from 3/4" to 1-1/2". The exact shape of the granite cannot be specified because the granite is free-form. Please note that the stones have a shiny gloss that is not shown but is used as a sealant to protect your stone. We hand-pick each stone to compliment your choice of words. 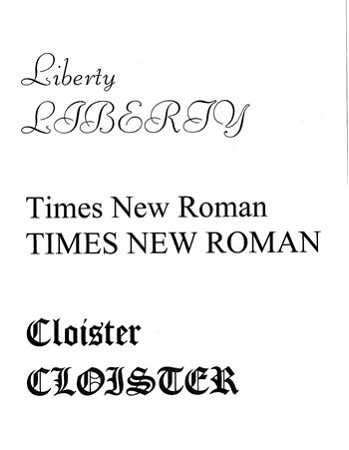 Medium (#319) - 8" x 11", 15-20 lbs: Holds up to FOUR lines with a maximum of 21 characters per line. Large (#320) - 11" x 16 " 30-40 lbs: Holds up to SIX lines with a maximum of 21 characters per line. Memorial stone can be displayed upright or flat.